If you’re a seafood lover, you may enjoy eating both shrimp and scallops. But for some, one is a favorite over the other, especially since the tastes and textures of each are different. Much of the taste difference is due to the fish’s diet and the fact that their fat is held in their oil and then dispersed throughout their body. Shrimps feed on plankton, worms, and small shellfish. Whether a shrimp comes from freshwater or saltwater will determine its overall flavors and texture. People love eating shrimp because they are relatively inexpensive. Plus, there are hundreds of ways to incorporate them into recipes, whether you want to eat them cold as an appetizer or cooked on a teppanyaki grill served with vegetables and fried rice. Scallops feed on microscopic plants and animals by using the tiny hairlike structures called gill cilia along with mucus to move the food particles towards their mouths. When prepared correctly, scallops are sweet and tender, requiring little added flavor because they are delicious on their own. Scallops can be cooked in a variety of ways including baked, fried, pan-seared, or grilled. Their texture should be soft and chewy, not rubbery or tough. 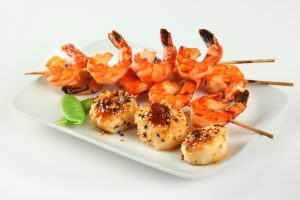 Whether you enjoy eating shrimp, scallops, or both, these quick cooking lean proteins make for a delicious and decadent meal. If you’re in the mood for seafood, experience entrees made with shrimp, scallops, calamari, and lobster at Shōgun Japanese Steakhouse. Located inside the Rosen Inn on International Drive, our staff is dedicated to giving you a meal of a lifetime. For reservations, please call 407-352-1607 or reserve your table online.